The Midwest has some of the highest Radon levels in the country. ​Call for Air or Water testing using my state of the art equipment. I use the only commercially available system that utilizes the Electret Ion Chamber (EIC) technology and is sold under the brand name E-PERM®. Considered by many the most accurate. You will receive a report immediately after your test. No waiting for mailed in lab results. I specialize in time sensitive Real Estate transactions. I strictly follow EPA guidelines. Very affordable. Depending on your location, prices start for as little as $125.00. Discounted when combined with an Inspection. Radon in water test $125.00. EPA recommends if your Radon level is high and you use well water, have your water tested for Radon. More about home inspections here. Radon is a cancer-causing radioactive gas. It's original source is Uranium. You cannot see, smell or taste radon, but it may be a problem in your home. The Surgeon General has warned that radon is the second leading cause of lung cancer in the United States today. If you smoke and your home has high radon levels, you're at high risk for developing lung cancer. Some scientific studies of radon exposure indicate that children may be more sensitive to radon. This may be due to their higher respiration rate and their rapidly dividing cells, which may be more vulnerable to radiation damage. Radon is not produced as a commercial product. Radon is a naturally occurring radioactive gas that comes from the natural breakdown or radioactive decay of uranium. It is usually found in igneous rock and soil, but in some cases, well water may also be a source of radon. PROPERTIES: Radon is a gaseous highly radioactive element discovered by English physicist Ernest Rutherford in 1899. The discovery is also credited to German physicist Friedrich Ernst Dorn in 1900. More specifically, Rutherford discovered radon's alpha radiation and Dorn discovered that radium was releasing a gas. Radon is a colorless chemically-unreactive inert gas. Radon is nine times denser than air. Because it is a single atom gas it easily penetrates many common materials like paper, leather, low density plastic, most paints, and building materials like drywall, concrete block, mortar, wood paneling, and most insulations. Testing is the only way to know your home's radon levels. There are no immediate symptoms that will alert you to the presence of radon. It usually takes years of exposure before any problems surface. See the US EPA, Surgeon General, American Lung Association, and the National Safety Council for recommendations for testing your home for radon, because testing is the only way to know your home's radon levels. There are no immediate symptoms that will alert you to the presence of radon. Please test. Radon is a national environmental health problem. Elevated radon levels have been discovered in every state. The US EPA estimates that as many as 8 million homes throughout the country have elevated levels of radon. You can see the EPA's map of Radon levels here. It is estimated that 1 in 5 houses in the U.S. have elevated levels of Radon. If your home has high concentrations of radon there are ways to reduce it to acceptable levels. Most radon problems can be fixed by a DIYer for less than $500. If you want or require the assistance of a professional you can find information and links for Kansas here. Many fear testing for Radon during a Real Estate transaction because they are afraid of the cost. The fact is that Radon mitigation doesn't cost any more than many other home repairs. If you are a DIYer you may be able to do the work yourself. This image shows what a typical system looks like. The following "Radon Myths" is taken from the EPA's "Citizen's Guide to Radon". Radon is a real problem. It is life threatening. If you are reading this and live in this service area you probably live in what is referred to as "Zone 1" which according to the EPA has the highest levels of Radon in the United States. It is not expensive to have your house tested and if a high concentration is found it is not difficult or prohibitively expensive to mitigate the Radon problem. I am not affiliated with any mitigation company so you can rest assured you will receive an accurate test with a completely neutral report. Please Contact me for more information or to schedule a test. MYTH: Scientists aren't sure radon really is a problem. MYTH: Radon testing is difficult, time consuming and expensive. FACT: Radon testing is easy. You can test your home yourself or hire a qualified radon test company. Either approach takes only a small amount of time and effort. FACT: There are simple solutions to radon problems in homes. Hundreds of thousands of homeowners have already fixed radon problems in their homes. Most homes can be fixed for about the same cost as other common home repairs; check with one or more qualified mitigators. Call your state radon office for help in identifying qualified mitigation contractors. FACT: House construction can affect radon levels. However, radon can be a problem in homes of all types: old homes, new homes, drafty homes, insulated homes, homes with basements, homes without basements. Local geology, construction materials, and how the home was built are among the factors that can affect radon levels in homes. MYTH: Everyone should test their water for radon. 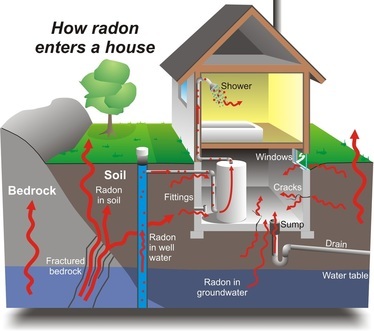 FACT: Although radon gets into some homes through water, it is important to first test the air in the home for radon. If your water comes from a public water supply that uses ground water, call your water supplier. If high radon levels are found and the home has a private well, call the Safe Drinking Water Hotline at 1 800-426-4791 for information on testing your water.